In the immediate vicinity of Sanok, Podkarpackie Province, on the area of a mere few square kilometres, as many as four strongholds have been localized, creating sort of two corresponding pairs (fig. 1). Although the strongholds’ chronology is not wholly coherent, one may wonder at their close location, especially as sites of this type were as a rule situated a dozen or so kilometres away from one another. The fact that there existed as many as four strongholds does not seem to be accidental, then. The older complex at Trepcza village consists of „Horodna” and „Horodyszcze” strongholds. The younger complex at Sanok, is made up of the „castle hill” and „Zamczysko” stronghold. The archaeological research conducted in the recent years as well as reviews of museum collections and in-house studies seem to be sufficient enough to outline the mutual relationships between the sites. Until recently, the stronghold on the „castle hill” in Sanok was regarded as the central point of the whole stronghold complex. The stronghold functioned mainly in the 12th and 13th cent. Its location on this site provided a perfect protection of the left river bank. On the other side of the River San, there is a stronghold called „Zamczysko”, which is located in the Sanok-Biała Góra quarter. It is commonly dated back to the latter half of the 12th–13th cent. Just like the „castle hill” stronghold, it controlled a considerable area of the valley of the River San, mainly in the southern direction. The surface penetrations of „Horodna” and „Horodyszcze” strongholds at Trepcza carried out in the recent decades, made the researchers dealing with the early mediaeval history of the area of Sanok think that it was there that the original stronghold mentioned by the same name in chronicles existed, and which was later quite mysteriously moved to the Sanok „castle hill”. The recent archaeological studies conducted at „Horodyszcze” confirmed those speculations and revealed sensational and unique objects of Old-Ruthenian architecture and numerous historical movables, which indicate that it was there that the administrative centre of the whole region was located. The first of Trepcza strongholds, „Horodna”, has not been examined apart from metal-detector prospection; it is dated to the 9th-11th (12th?) cent. The other stronghold, „Horodyszcze”, is dated to the close of the 8th – beginning of the 9th cent., based on the analysis of characteristic artefacts. Such an arrangement was not coincidental. Almost all the parts of the complex, with the exception of „Horodna”, had an excellent visual contact, which suggests a close relationship between them. Let us look at the functioning of the strongholds analysed in two time brackets which were successfully isolated mainly on the basis of historical movables, and then associated with other data suggesting the existence of an elaborate military concept in this area. The former of the time brackets dates back to the tribal stage of the early mediaeval period, mainly to the 9th-10th cent. This was probably the time when the two Trepcza strongholds functioned. Unfortunately, it is not known whichever of the present day strongholds held the dominant position. In both of them some characteristic objects of pre-state origins have been discovered. Near the „Horodna” stronghold there have been discovered mainly roughly dated arrow heads (fig. 5:A-E), but the tribal origins of the stronghold may be confirmed by an iron loop, arguably used with a spur (fig. 5:I). 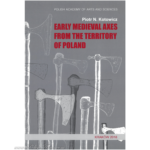 A significantly wider range of objects from that period comes from the „Horodyszcze” stronghold, featuring such items as an axe and a battle-axe , discovered in the treasure of iron objects (fig. 6:A-B). Other characteristic items include a specimen of a eyed spur unique in the Western Slavonic land and connected with the Merovingian and Carolingian circles. 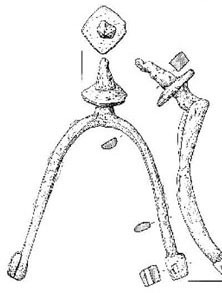 There were three hooked spurs (fig. 10:A-B) and a nomadic arrowhead tip with a three-angular blade (fig. 8:A). 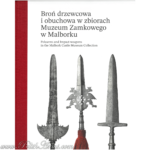 The above sources documenting the military readiness of Trepcza strongholds confirm the significance of Sanok and its surroundings in the tribal period when the Trepcza centre was arguably one of the most important military centres of the Slavonic tribe of Lędzianie. When did those prosperous times end? Probably in the 10th cent. 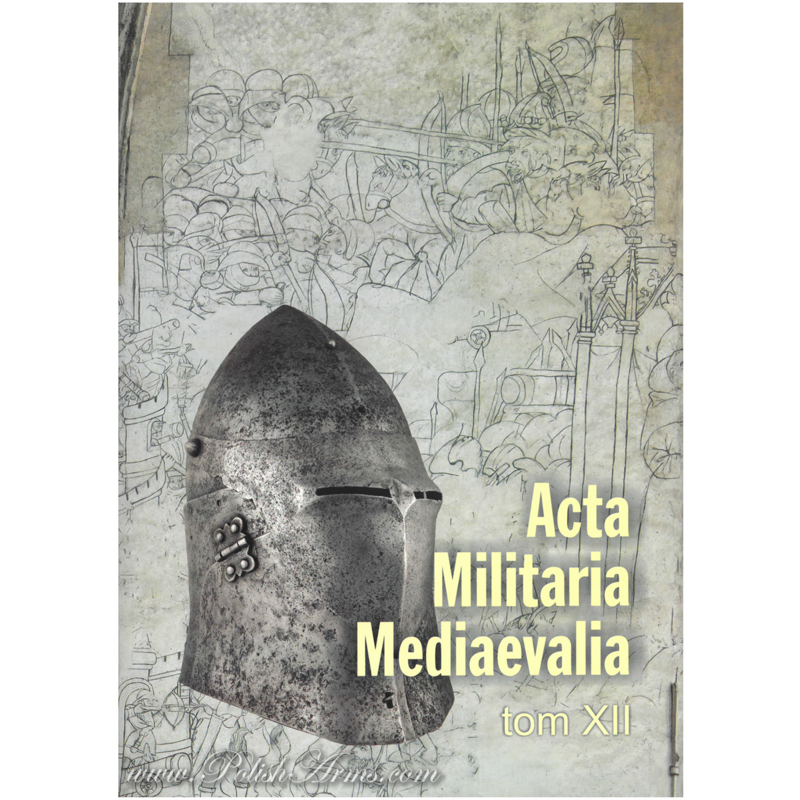 ; however one cannot rule out the first decades of the 11th cent. Unfortunately, one cannot be too sure whether it happened in the aftermath of the intervention of Magyars, who at that time were migrating to the Hungarian Lowland, or during the famous expedition of Vladimir the Great against the Lędzianie in 981, or maybe as late as after 1031 during the military escapade of Jaroslav the Wise. It is a fact, however, that there is no clear horizon for the finds which would connect the two aforementioned time brackets, i.e. the tribal and early-statehood periods. This may be a transitory state arising from the current stage of research. The next stage of the functioning of both „Horodyszcze” and Sanok strongholds to be clearly distinguished in the archaeological materials is associated with the late stage of early Middle Ages – mainly the 12th-13th cent. In particular, a lot of materials were found in the former stronghold associated with the Sanok as described in chronicles. 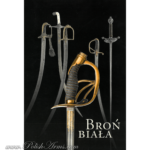 They include military items and parts of horse-riding kits, which bear testimony to the presence of an armed garrison in the stronghold, perhaps a group of serjeants-at-arms of the posadnik (castellan) known from the historical sources. The unique finds include fragments of two bronze objects, richly ornamented war-flails, associated with the Ruthenian magnates’ elite (fig. 6:C-D). The most interesting specimens of arrowheads feature a tang and a flat head, whose appearance in Central Europe is to be associated with the Tartar incursions (fig. 8: D, F, I-M). The rich set of military items is supplemented by parts of a horse-rider’s kit. They include a characteristic, for Ruthenium mainly, spur with a sharp-toothed rowel limited by a rectangular plate roughly (fig. 10:C). The other six items are spurs with rowels in the shape of a forked neck topped with a star-like wheel (fig. 10:D). Some military items were discovered on the „castle hill” in Sanok. They include such early mediaeval finds as arrowheads and, undoubtedly, a bronze ornamented spur (fig. 11:A-C). The military items found at the „Zamczysko” stronghold in Sanok-Biała Góra quarter are much more numerous. Apart from arrowheads and bolt heads, special attention should be paid to the finds unique in the Polish land, namely a few dozens of lamellar armour plates (fig. 12:A-M). It can be seen that the archeological sources gathered give us an excellent confirmation of the existence of those sites in the periods in question. It seems very unlikely that the strongholds were autonomous. 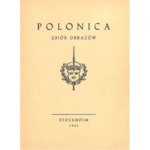 The fact that they were seated close to one another, a smaller size of the strongholds on the „castle hill” and in „Zamczysko” in Sanok, as well as the discoveries made at „Horodyszcze” in Trepcza suggest that the main site which controlled the others was the latter stronghold. minor guarding settlements in Sanok and Sanok-Biała-Góra, with garrisons stationing there. This may also be confirmed by another reference on Sanok. The entry made at the year 1231 mentions the trip of Włodzimierz Juriewicz to the Sanok of Uhorskie Gates. According to the subject literature the term „Uhorskie Gates” signified one of the passes (Łupkowska Pass) located near Sanok. Contrary to these opinions, one should note that the chronicler clearly referred to Sanok as the gates. Another look at the map of the Sanok strongholds complex makes it clear that the two southerly guarding settlements situated within the administrative area of the present day town create kind of gates leading to the main stronghold of „Horodyszcze”. 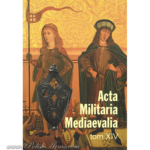 The whole military complex was ruled by posadnik (castellan), referred to in the chronicle „Latopis Hipacki” at the year 1150, probably a functionary of Przemyśl and then Halicz Dukes. What precise administrative and military area did he control? Regrettably, this remains unknown. This could have been a so-called volost’, an Old-Ruthenian territorial unit of a minor rank often mentioned in Ruhenian chronicles. The end of the Sanok military complex and the deterioration of the transport and trade route along the River San might have been the aftermath of the 13th century Tartar incursions. It might have been December 1240, when the Mongolian troops, after conquering Kiev set off to attack the Duchy of Volodymyr and Halych. Its is possible that also Sanok suffered in the course of those events as the most westerly military point of the Duchy, especially as the majority of Tartar forces were assembled on the northern bank of the Dnyestr River, wherefrom to attack Hungary. 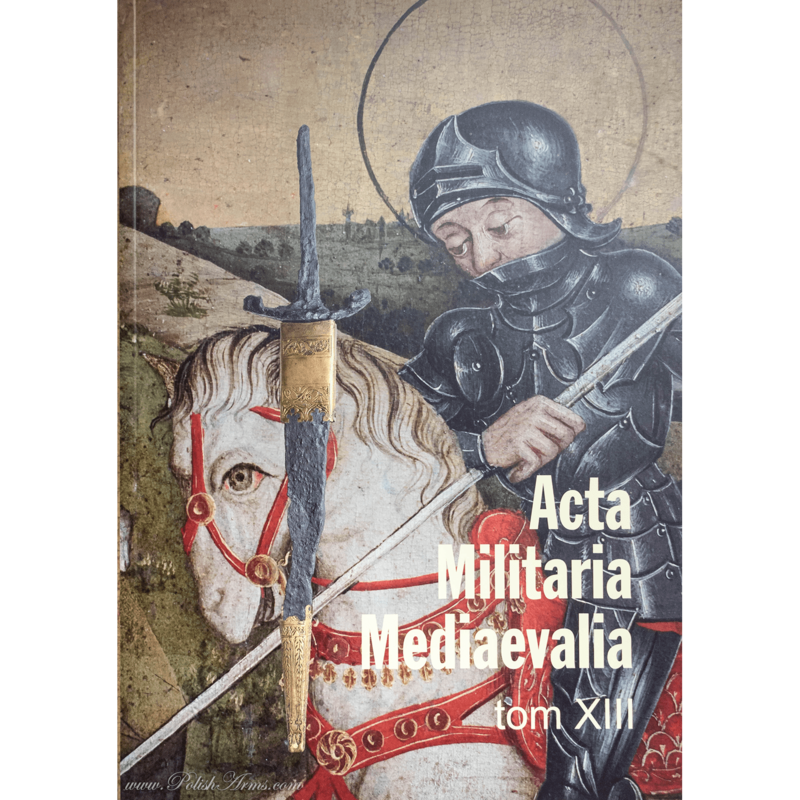 Meanwhile, the chronology of most of the historical items discovered at Trepcza stronghold of „Horodyszcze” suggests that the damage might have been inflicted at the beginning of the 1260s during the second Tartar incursion into Poland. One of its objectives was to ultimately subdue the Duchy of Volodymyr and Halych. According to historians, the Tartar army returned from the expedition against Poland along the route to Jasło and ventured as far as the Carpathians. After one of the Tartar incursions, it seems that the Trepcza stronghold on the „Horodyszcze” hill ceased to play the role of an important military, strategic and administrative centre on the periphery of the Ruthenian land. The Sanok-Biała Góra stronghold might have fallen then, too. The military system of „Uhorskie Gates” proved unsuccessful as it was directed against the most probable enemy – the Hungarian Kingdom. Who could have anticipated that the biggest threat would come from the apparently safest direction? Maybe it was the shattered confidence of the inhabitants about the defensive qualities of the main stronghold and the auxiliary strongholds as well as the lack of prospects for its further development that forced them to move the centre of the local authority to the „castle hill” in Sanok.